The Town of Delavan Friends of the Parks, in conjunction with DelavanLakeProperty.com, will be hosting a “Winter Lake Fest” February 15, 2014. The festival, held at the Town of Delavan Community Park will start at 3:00 pm and end at 10:00 pm. The festival is concurrent with the “Sky Circus on Ice” being sponsored by Lake Lawn Resort. The Sky Circus will feature professional kite performances over Delavan Lake and ice carving and snow sculpting. Attendees will be able to warm up inside the heated pavilion at Community Park and enjoy the complementary music of Simple Rezonation and The Glen Davis Band. In addition to free admission to the two bands, there will be chili, hotdogs, beer and soda available for purchase along with free gifts for the first 200 through the door. The Town of Delavan Community Park is located at the intersection of Hwy 50 and South Shore Drive. Simple Rezonation features Folk Rock while The Glen Davis Band is a regionally recognized Blues performer. Ice fishing activity is active on Delavan Lake with the majority of anglers being seen in the bay off of Lake Lawn Lodge. The average ice depth on Delavan Lake ranges between 9 to 15 inches currently, and that will likely change over the course of the next 10 days due to the extremely cold conditions we’re expecting to roll in tonight. The barometric pressure as of this morning was 29.83, but with the cold temps heading our way today or this evening, it may dip down to 29.40 or lower, we’ll see. Anglers have been reporting the best bite occurring mid to late afternoon between three and five p.m.
Safety has been an issue due to the ice shifts/mounds of ice that people may not be seeing as they come on and off the lake. On Sunday, a fisherman rolled his all-terrain vehicle over by Lake Lawn, but there were no reports of serious injuries. Work the drop offs, jigging and/or with your tip-ups. Some bigger females have been taken recently ranging from 30 to 38 inches on these ledges. The shiners have been more productive that the chubs, and the tip-ups more productive than the jigging with artificials. The fish have been fairly aggressive, and many tip-up anglers have been leaving their minnows just below the ice without a split shot in shallower weedy water, allowing for greater action from the shiner and no tangles in the weeds. Some hammer-handles have been taken with crappie minnows and Rapalas as well. Some nice walleyes have been taken in deep water. Anglers are reporting them as deep as 45 feet on the flats. They’re biting lite and dropping the bait. Panfish activity has been consistently good on the east side of the lake, with anglers getting bluegills and crappies on spikes in about 7 feet of water. Sales of Delavan Lake property in 2013 remained at a level similar to the previous two years with steady sales activity and declining inventories. For the entire year, there were 19 waterfront properties sold, compared to 20 sales in both 2012 and 2011. There were also 32 lake access homes sold in 2013 which was one more than last year. 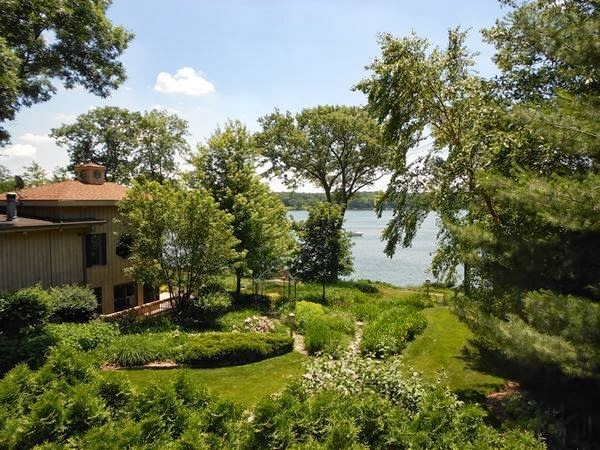 The range of lakefront sales was $267,000 for a three bedroom, one bath home with 90 feet of frontage on the Delavan Inlet to a $1.25 million estate with 100 feet of level South Shore frontage, four bedrooms, five baths, and an in-ground swimming pool. The range of lake access homes sold in 2013 was $53,000 for a two bedroom, one bath, foreclosure in the Delmar subdivision, to $370,000 for a large, four bedroom, two bath, A-frame with direct lake views in the Viewcrest subdivision. There were 15 Delavan Lake condos sold in 2013 compared with 16 in 2012. The range of sales was $20,000 for a Delavan Lake Resort condo/hotel room, to $240,000 for a three bedroom, three bath Delavan Gardens unit with direct lake views, attached garage and a boat slip. The inventory of homes for sale with Delavan Lake frontage or lake rights has dropped from 60 in January of 2012 to only 53 today. The drop in inventory may signal that prices will begin to firm again this spring. For a lakefront property, the range in price is $150,000 for a one bedroom on Browns Channel with 120 feet of frontage, to $1.6 million for a North Shore estate. The starting point for water frontage is this adorable one bedroom on Browns Channel. The North Shore estate includes five bedrooms and four baths in the main house, flowing gardens, a private water fall, 132 feet of frontage, eight heated garage spaces and a studio apartment featuring its own deck and direct lake views. Lake access properties start at $64,900 for a three bedroom, one bath cottage in the Delmar Subdivision, to $375,000 for a four bedroom two-story in the Viewcrest subdivision. The number of condos with lake rights that are currently for sale has dropped to only 17 this year compared to 37 last year. Units currently available range from a $24,500 one bedroom unit in Delavan Lake Resort, to $299,900 for a three bedroom, three bath Delavan Gardens unit that includes an attached garage and boat slip. 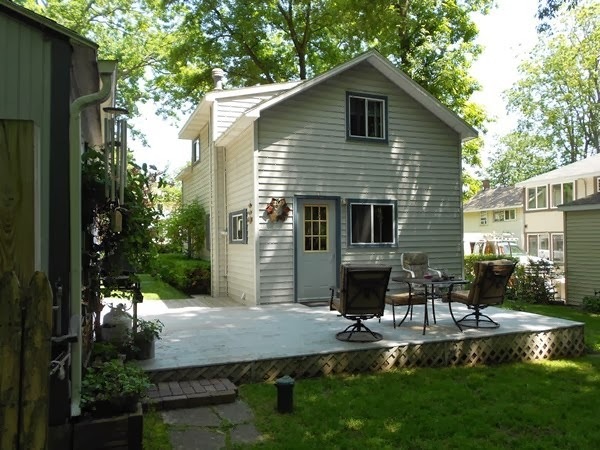 The best value for a lake access property on Delavan is a well-maintained, two bedroom, one bath home located on Jackson Park Drive. 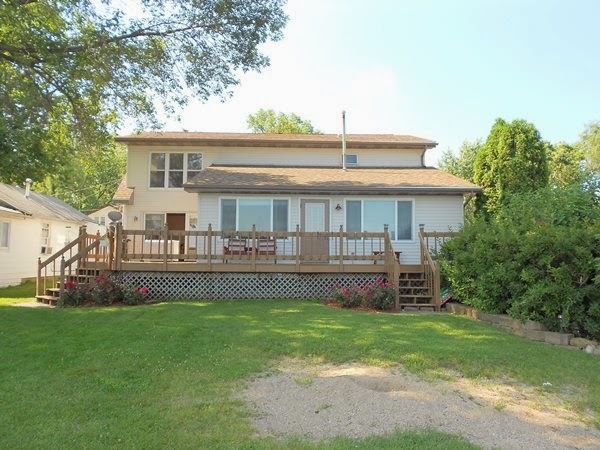 This home has a large deck, detached 2-car garage and comes with a boat slip on the main body. It is listed for $174,000. 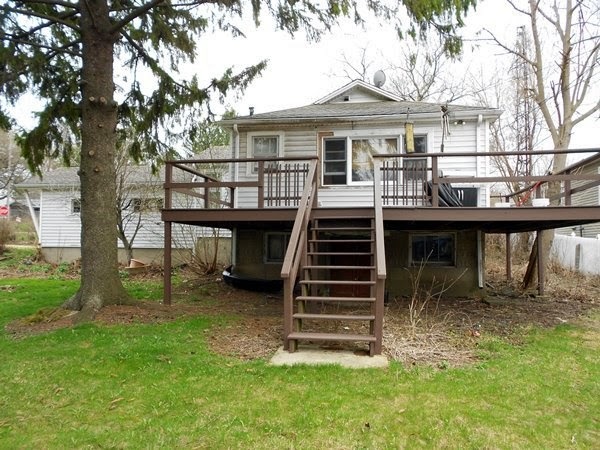 With the least expansive boat slip on Delavan, this Jackson Park home has affordable appeal. The best value for a Delavan lakefront is a three bedroom, three bath South Shore home resting on 50 feet of private frontage. Located at 4146 Blue Gill Road, this home features a wrap-around deck, a detached 2.5 car garage and views of the entire lake. This home on Blue Gill offers a first floor master, open concept second level and expansive views. The best value for a lakefront condo is a two-bedroom, two-bath unit in Delavan Club. Listed for $209,000, the unit has a main floor bedroom, second floor suite and lofted views of the Delavan Outlet. 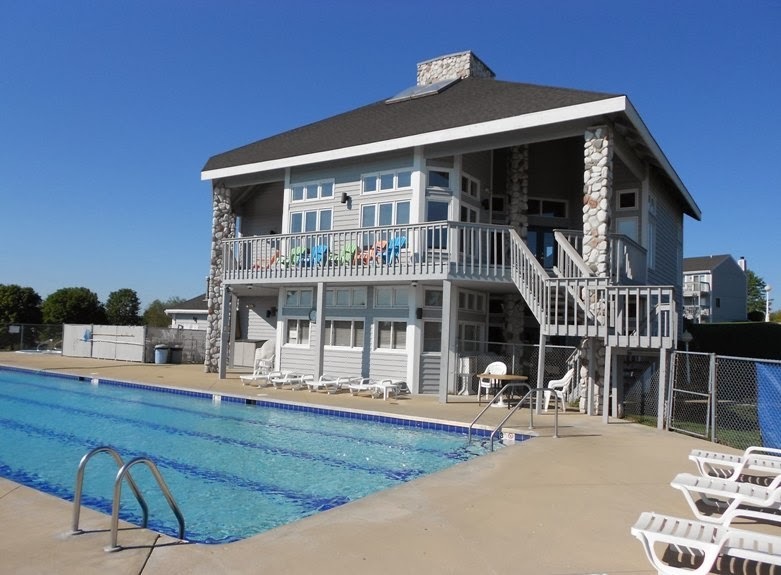 The complex contains an outdoor pool, club house, boat slips, and a fitness room. The club house at the Delavan Club offers a large pool and spacious work out facility.